Is it safe to camp in a motorhome over Winter? insulated and heated water and holding tanks. Die Wohnmobile verfügen über individuell angefertigte Charakteristiken, damit sie bei fast allen Winterbedingungen Sicherheit bieten. How do I prepare for a Winter RV Vacation? 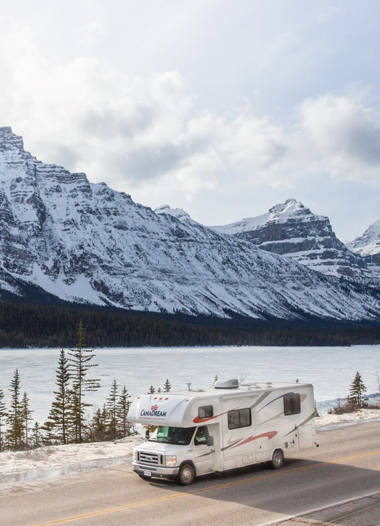 CanaDream takes the worry out of your Winter RV rental vacation. Our motorhomes are equipped with everything necessary to ensure you are kept warm and dry inside. All you need to bring is enough suitable clothing to ensure you keep warm while experiencing your chosen outdoor activities. Do I need to plug into an outside electricity source every night? No. Our winter RVs are designed to be fully independent with 4 coach batteries and a generator. The coach batteries operate the interior lights, water pump and furnace fan. If you need to use the microwave or 110V electrical outlets when you are not plugged in to an outside electricity source, or you wish to charge the coach batteries, you can do so by operating the generator. Are there any campgrounds open over Winter? Yes, many campgrounds remain open during the winter and we have compiled a list of those campgrounds for your convenience. You can view these by clicking on the links on our Winter Camping page. Can I park overnight in ski hill car parks? Yes. Many ski hills do allow their guests to overnight in their car parks. Please ask for permission from ski hill management before doing this. Is there a furnace in the rental RV? Yes, there is a high efficiency propane thermostatically controlled furnace that you can set to your desired temperature and comfort setting. The furnace fan operates off the four independent coach batteries that automatically recharge while you drive and/or plug into 110V power or use the generator. The coach batteries are independent of the engine battery. Can I use the water in a CanaDream RV on my winter RV rental vacation? Yes. CanaDream has winter specific RVs which are manufactured to allow for use of all facilities (including shower, toilet, sink) in winter temperatures. These RVs have insulated and heated water and holding tanks to stop water freezing in the lines. Are CanaDream RVs equipped with winter tires? CanaDream RVs are equipped with All-Season tires. These tires are rated for Mud and Snow. Can I travel into the USA during the winter with my rental vehicle? Yes. Our Winter Pillow & Powder rental rates (November 1st to March 31st) include travelling in the USA. Please also note that U.S. Department of Agriculture may not allow fresh meat, fruits and vegetables across the border. If you are planning on crossing into the USA we suggest you shop for your groceries once you are in the United States. Do I need to use chains on the RV rental over winter? No. All main roads in Canada are kept ploughed and are drivable during winter. It is very rare that you will require chains on any main roads or ski hill access roads. Where do I store my skis in the RV? CanaDream RVs have large outside ski storage lockers at the rear of the vehicle. There is ample storage in these lockers for skis and other equipment. How do I dry my wet boots and other clothing after a day out skiing? There is a furnace vent in the bathroom which pushes heat into the shower stall, making it an excellent place to dry wet boots and clothing. How many people can travel in a CanaDream Winter RV? Unsere Winter-Wohnmobile sind extra für die Nutzung im Winter hergestellt. Dort finden bis zu vier Erwachsene und zwei Kinder bequem Platz.